Apple is all set to launch the 10th edition of iPhone, some call it iPhone 8, some iPhone X and some of them as iPhone edition. So, whatever you call the device by name you must be aware that device is in news for all the small leaks or hint people get from the different source. In the similar finding, iOS 11 gives some hint about the upcoming iPhone. A new Siri icon spotted in iOS 11 appears to confirm rumors about the upcoming iPhone 8’s design. As we all are aware (from different reports) that Apple is widely expected to drastically change the look of the iPhone this year, with the company seemingly set to take a similar approach to Samsung. The Galaxy S8 ditched the physical home button for a stunning “all-screen” design, which makes all other handsets on the market look outdated, and the next iPhone will almost certainly follow suit. The new Siri icon in iOS 11, an eye-catching, animated, multicolored swirl, is the same size as the iPhone’s home button and sits “in exactly the same spot where a home button would be on an edge-to-edge iPhone without a customary home button in the bezel”, reports Apple Insider. Apple will drop the iPhone’s iconic physical home key with the iPhone 8, according to numerous reports, in order to maximize the handset’s screen-to-body ratio. It could measure 5.8 inches and feature a built-in virtual home key and Touch ID sensor. Cutting down the bezels and building a virtual home button into the iPhone’s screen is both sensible moves. While the iPhone is an attractive device, Apple has barely changed the device’s look in recent years, allowing Samsung to catch up and surpass it in the design stakes. Other than the screen, rumors have been swirling for more than a year that Apple may be working with Energous to add long-range wireless charging to the iPhone. The technology would allow an iPhone to be charged wirelessly by a special base station from across a room, at distances of up to 15 feet. 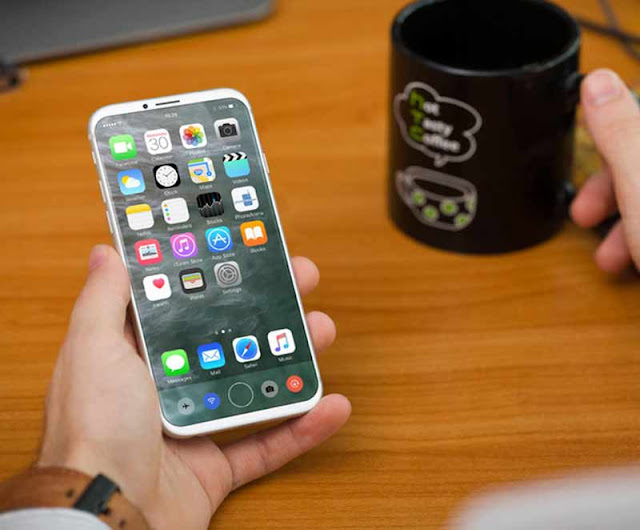 While the two companies may or may not be working together and, according to a new in-depth analysis, they are not working together at all it seems unlikely that Energous’ technology would be ready in time for a September iPhone launch. Instead, it’s increasingly likely that the iPhone will feature standard inductive wireless charging similar to what Apple uses on the Apple watch. This technology uses magnets to transmit energy, and it requires the target device to make contact with a charging mat in order to charge.